The bedroom had the same popcorn texture as the other rooms, and of course it was on the walls, ceilings, outlets, and baseboards. I decided before I took the carpet out I needed to get rid of the bumpy walls. That’s where the photo above comes in… because that’s what it was like when I was sanding. 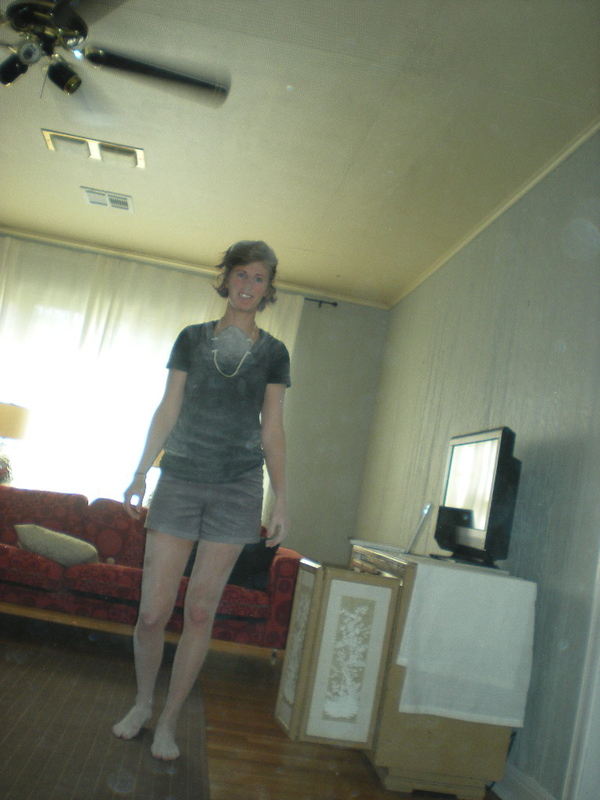 Things were very dusty, and I looked like a ghost. After I checked the sanding off the list, it was time to get rid of the carpet. I knew there were wood floors somewhere underneath, but I wasn’t sure exactly what I would find. I was not really expecting 1970s linoleum with sparkle in it!!! At this point, I was feeling a little overwhelmed and horrified by all the linoleum that would need to be scraped up. 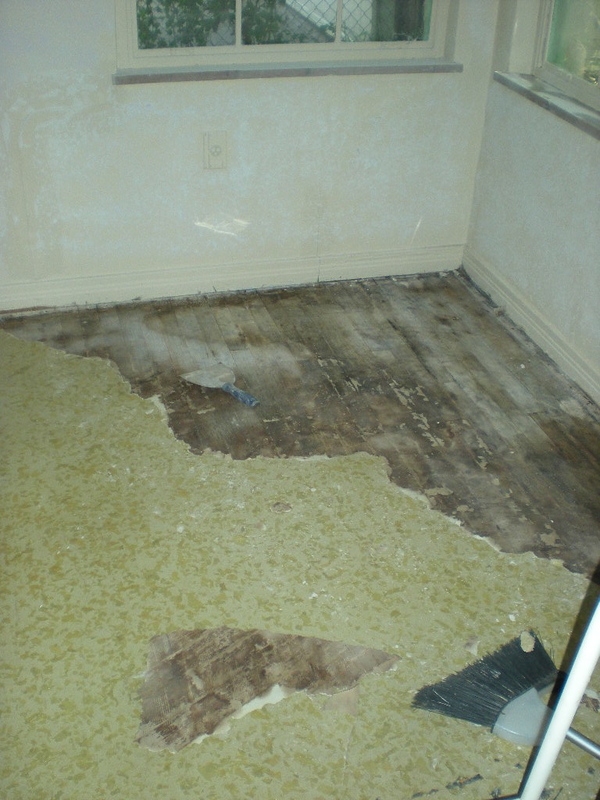 We had experience in the living room with scraping linoleum glue off of a wood floor, and it was not fun or easy. Here was my small attempt. This took forever, and I was ready to hand it over to the professionals. 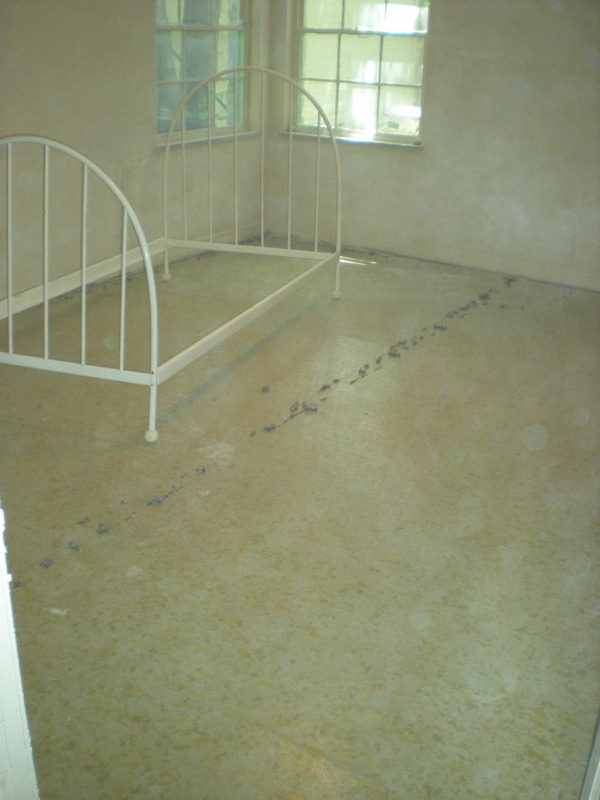 I called around to a couple of places, and I found a company who could sand it and have it finished in a couple of days. Tomorrow I’ll post the results of the professionals work. You’ll be amazed at what a little sanding can do, well maybe a lot of sanding. WOW, Anne! How insane! I would have called in the professionals for that, too. I can only imagine how difficult that must have been to scrape that stuff off. Make sure you wear that face mask every time you do anything that involves the particles flying about. I’m sure it’s not healthy to breathe that in and it looks like there were mounds of that stuff floating about! It is ghost-y. :) Looking forward to seeing you soon. Great work, by the way! Really want to see all the progress in real life!! It was definitely a job for the professionals! 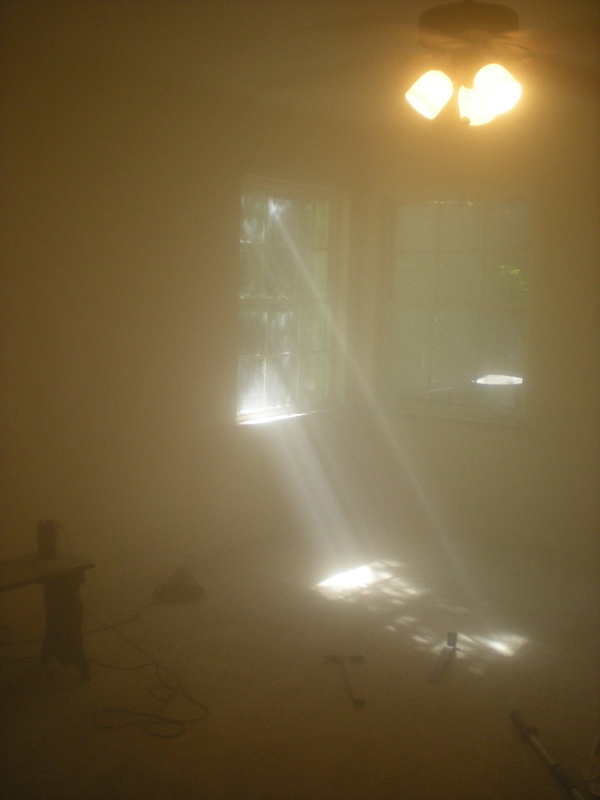 I wore a face mask while I was sanding, but I really wish that the windows in that room weren’t painted shut so I could have had some fresh air. I’m happy it’s done and ready to do some furniture arranging. :) Can’t wait to see you! Wow. I saw that first photo and it looked like a UFO was landing or something! LOL And seriously? They put popcorn on the WALLS?! Yeesh! Kudos to you for sanding it all off! That’s alot of sanding. 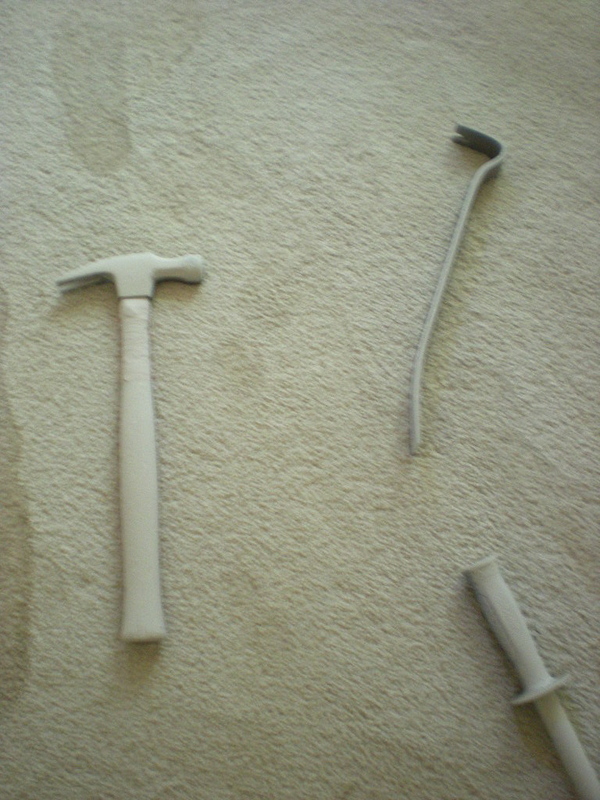 Sanding has to be the thing I hate the most… hate, hate, hate it! I don’t blame you for calling in the pros for that linoleum… it took us weeks of hard labor to get all the peel-and-stick laminate tiles (from the 70’s, too) out of the basement. Ugh. Thanks for the encouragement, Chelsea! :) I couldn’t believe about the popcorn either! Who wants that stuff on their walls or really anywhere? That first picture looks ethereal and the third picture looks like a moon scape. Oh those 70’s – avocado appliances, sparkly linoleum, etc, etc. I am confused…. 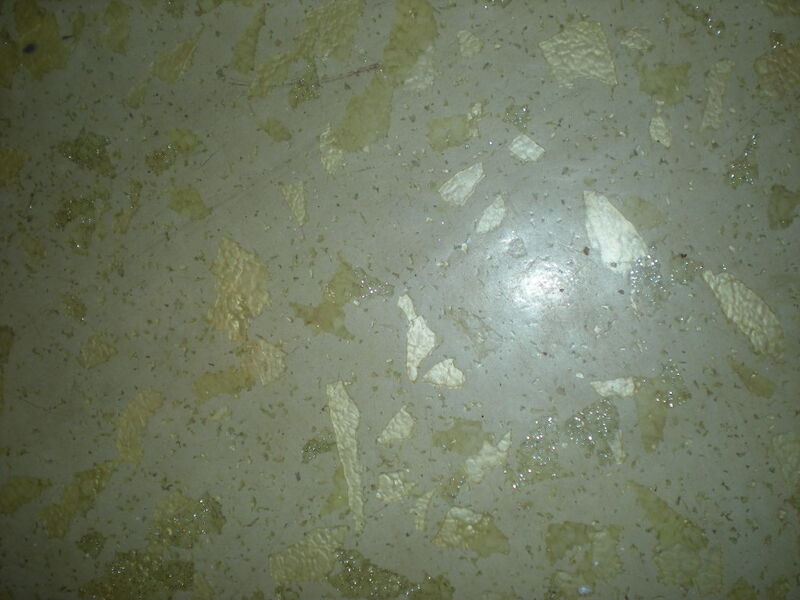 why did you want to get rid of the sparkle linoleum?